But the truth is that a regular, well-written and well-researched blog, when used correctly (which is to say strategically), can be one of the most powerful marketing tools a brand has at its disposal. Far more than just content for content’s sake, enterprise blogs are a means to an end – the end being leads, which can then be converted into sales. 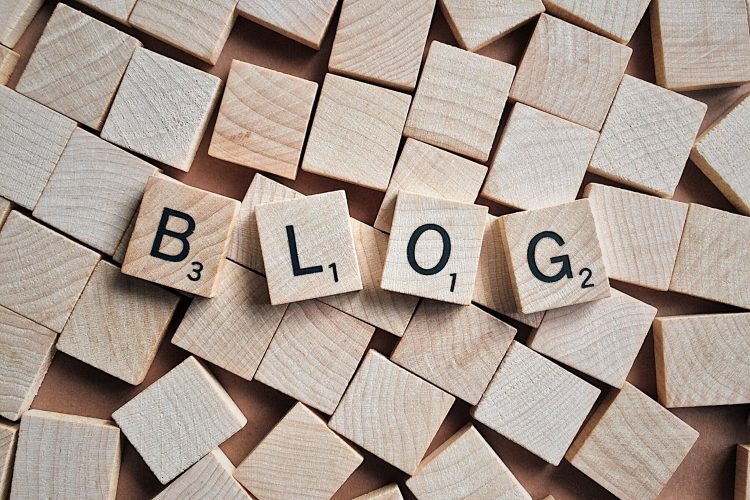 Blogs, indeed, are an essential component of any content marketing or inbound marketing effort – which is precisely why brands need to get serious about them. It doesn’t matter if you’re in B2B or B2C – blogging gets results. Research from inbound marketing giant HubSpot reveals that B2B marketers who use blogs generate 67% more leads than those who don’t, while B2C companies that blog generate 88% more leads. What’s the reason the for this? Well, today, no matter your business, your customers begin their search for product information online. They don’t visit a shop or a showroom, or wait around to see an advert on TV. They don’t hold out until a cold call interrupts their afternoon at work or evening in front of the fire. No, in 2017, as soon as a consumer (either professional or private) wants something, they fire up their search engines and cruise around the web until they find it. It may seem impersonal – in days gone by, we all had to rely on face-to-face interactions with a sales representative to find out everything we wanted to know about a service or product. But today, it’s the building of digital relationships that has become one of the most important factors to marketing and commerce. And it’s a growing trend. Indeed, Gartner predicts that by 2020, customers will manage 85% of their relationship with an enterprise without interacting with a human. And this means that brands and businesses need to find ways and means to nurture relationships, educate their prospects, build trust, authority and reputation – all within the seemingly depersonalised online space. Blogging is one of the ways in which this is done. The power of blogging is now well recognised in the business community. 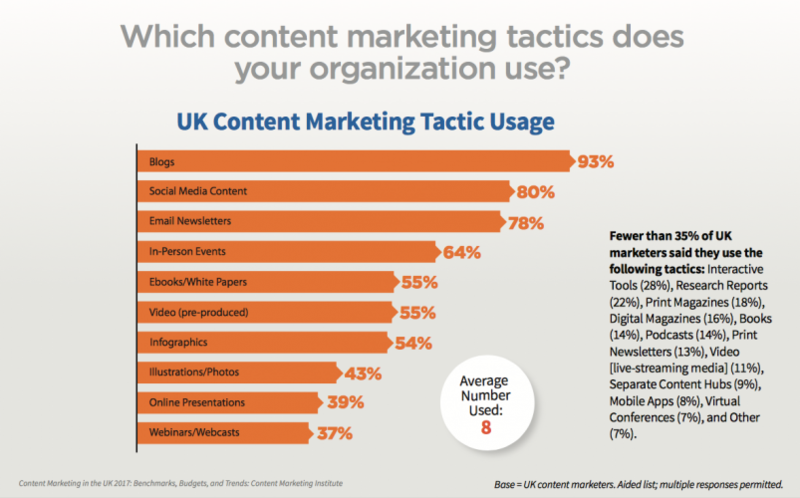 Indeed, in the UK, a massive 87% of businesses are today utilising content marketing, with 93% of these incorporating blogs into their ongoing strategies. 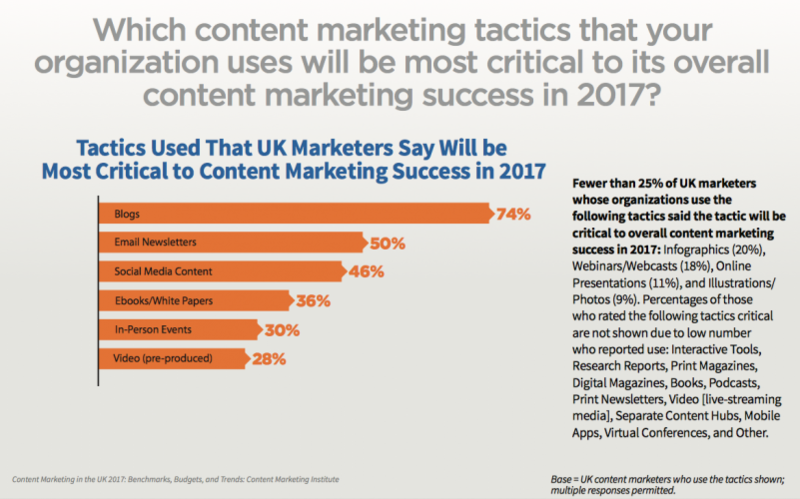 The figures come from the Content Marketing Institute’s latest report – ‘Content Marketing in the UK: Benchmarks, Budgets, and Trends’ – which also reveals just why it’s the blog that enjoys the most usage beyond all other content marketing tactics. Quite simply because blogs are considered to be the most critical tactic to content marketing success in 2017 for some 74% of organisations. The reason is that the humble blog is in fact a rather versatile instrument through which all manner of marketing campaigns can be launched and advantages achieved. Let’s consider what some of these are. In a world where consumers are relying on search engines to find the products and services they need, businesses need a way to make themselves discoverable online. Blogs deliver huge search engine optimisation (SEO) value for the websites in which they reside. Google and other search engines reward websites that are regularly updated with high-quality, useful content with high rankings on search engine results pages (SERPs) – and blogs are the most natural way to do it. What’s more, blogs are the ideal way for brands to build up a good keyword density on their websites, which again aids potential customers in their search. A well-written blog that contains lots of good research and other insightful industry news will also attract a lot of backlinks – another critical SEO factor. Indeed, companies who blog receive 97% more links to their website than those which don’t. In short, any business that continues to ignore blogging as a marketing tool in 2017 will struggle to get itself found online – especially when it’s up against competitors with solid content marketing strategies of their own. Sharing your industry knowledge, experience and expertise to a highly-targeted audience through well-crafted blog posts shows your customers and potential customers you know exactly what you’re talking about. Do this often, and your blog will soon gain the online reputation of being the go-to place for all the latest and most reliable industry news and insights. This builds trust and credibility – and customers are far more likely to engage with businesses that they deem to be experts in their field. You can use your blog to deliver useful tips, provide advice, answer customer questions, offer opinions, conduct interviews, and provide the details of the benefits of your products or services. In fact, the best blogs do all of these things and much, much more besides. If you think about your blog as a valuable customer resource, you’ll soon find that it starts generating some serious traffic your way, and more business will come out of it. Blogging is often (mistakenly) thought of as a strictly top-of-the-funnel (ToFU) activity – i.e. that it’s used to generate traffic and deliver brand lift, but not much more. 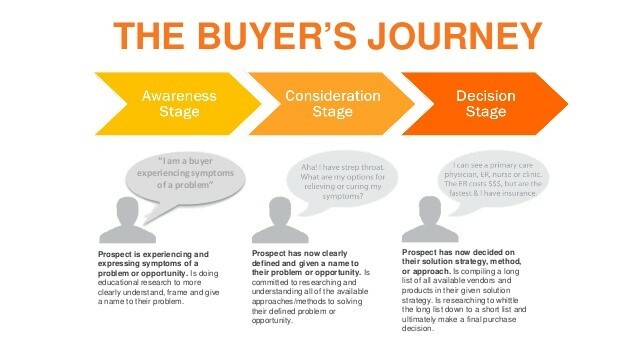 But the truth is that blogs play a crucial part at each of the three stages of the buyer’s journey: the awareness stage, the consideration stage, and the decision stage. During the awareness stage, your blog will help prospects who are just becoming aware that they have a problem that needs solving (with a product or service like yours) find your website. They’ll Google keywords and key-phrases, which the search engine will subsequently discover in your content, and return the appropriate links to the user. During the consideration stage, the prospect will have discovered your product, service or solution – but will be pitting your offering against your rivals’. Here, it’s important that your site is well-populated with blog posts that can answer any questions that these prospects have, and that you are presenting the level of expertise that will differentiate your business in the market. At the decision stage, your prospect will have decided to make a purchase – and so once again, your blog will become a hugely valuable resource for the prospect. It’s essential here that your blog continues to provide all the educational material the prospect needs that will ensure that it’s your brand that gets the business, and not a competitor. Your blog will also be important in the post-purchase stage – through the continuous delivery of valuable content that continues to solve any pain points your customers may have, you will enhance your chances of turning a one-off customer into a loyal and perhaps even evangelical one. Blogs are essential to a modern-day content marketing strategy. They deliver results at every stage of the buyer’s journey, enhance discoverability, deliver brand lift, build trust and authority, and will also be fundamental for generating leads for your business. What’s more, through your blog you are able to communicate your brand’s personality. Consumers may be managing more and more of their business relationships without interacting with an actual person – but that doesn’t mean you can’t inject a human touch into your brand’s marketing materials. And a regular, friendly, engaging, and informative blog is one of the very best ways to do it. If you need help with blogging, or any other part of your content marketing strategy, please don’t hesitate to get in touch with us here at Cope Sales and Marketing – www.cope-salesandmarketing. Looking forward to hearing from you!